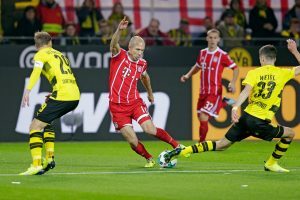 Stunned by surprise on RB Leipzig’s pitch before the break (2-1), Bayern Munich receive Borussia Dortmund on Saturday for the 28th day of the championship. With only 7 days left in Germany, Thomas Muller’s teammates will be very close to a successful championship, combined with a poor result from Schalke 04. In these conditions, and while Dortmund alternates the good and the worst in this year 2017-2018, it could quickly translate into a Bavarian show. Bayern are undefeated at home for 19 games. A series in which the Bavarians won 17 times for 2 draws. In his stadium, Bayern remains on a victory against Hamburg (6-0). Dortmund have won only 5 of their last 16 away games. Bayern Munich have won their last three matches with the BVB. Ascendant clear. Although Dortmund remains a big player in Europe, Bayern Munich is once again on another planet this season in the Bundesliga. Given his defeat before the truce the group of Jupp Heynckes will be highly motivated, so we do not imagine a second result than a victory.